You might know how to pimp up an old fashioned potato soup (add cheese and bacon). 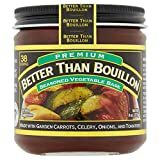 But how to create a vegan potato soup with proper 5-star potential? Again, I asked my brother Heiko (a chef by profession) to help us out with this task. In his opinion it’s all about the right flavours and making them shine. 1. Just the veggie stock, potatoes and ‘soup green’ (usually a pre-packaged bundle of carrots, leek, celery root and parsley) won’t cut it. There needs to be something more, but nothing outrageously expensive or exotic. The answer is pretty simple: ginger, garlic and lemon. Awesome! Ginger adds a nice sweet and sour aroma with a spicy note. Garlic gives us a sweet and pungent kick. Lemon is the fresh and sour antidote to balance everything out. 2. An excellent vegan fat for soups is coconut milk. You’ll note the difference right away, when you taste test the potato soup with and without it. It just brings the flavours to life. A nice bonus is the mouthfeel it creates. Smooth and comforting – hail to the fat! 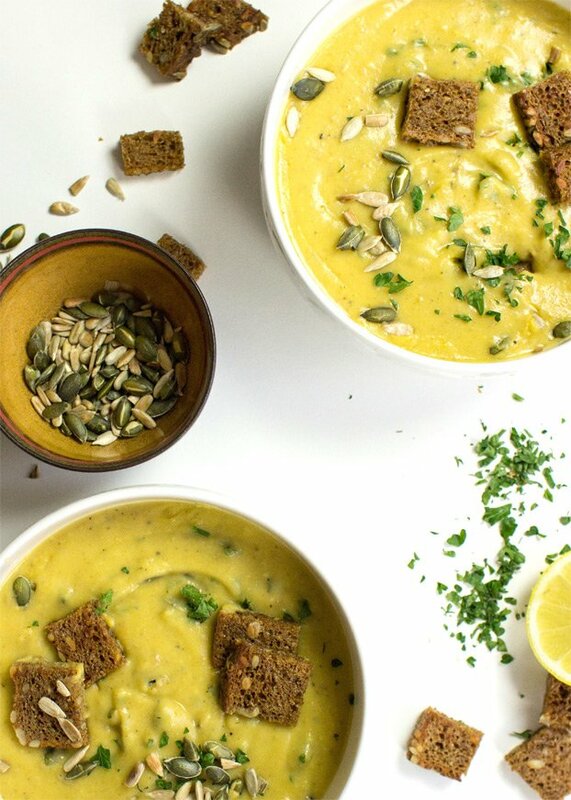 Et voila – we’ve just created a vegan potato soup that rocks! There is a debate as to whether potato skin is healthy or not. On one hand the skin contains many of the nutrients of a potato and is well worth eating from that point of view. On the other hand the potato skin contains a toxin called solanine, which can cause headaches and muscle cramps. Luckily the solanine levels are so low that your body will digest it without problems, unless the potatoes have turned green. Don’t eat those! To make sure that your potatoes won’t turn green store them somewhere dark, for example in a pantry or cupboard. Easy. Personally, I eat potatoes with the skin on all the time and I have never had any issues. 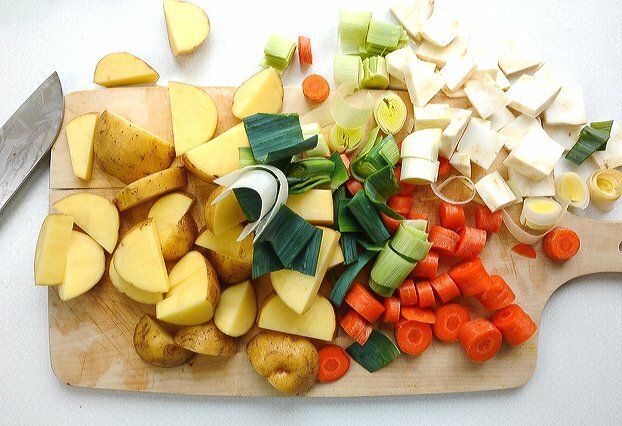 Buy ‘soup green’ (see 2nd photo) instead of all veggies separately. Given your local dealer has it in stock. Use a food processor to chop the ginger and garlic – this is especially effective, especially if you’re not fast with a knife yet. 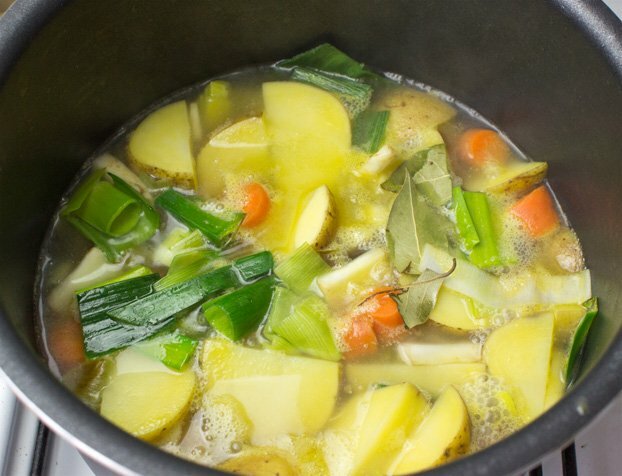 Heat the water for the veggie stock with a water kettle – if you use veggie stock powder, you can heat up the water quickly while chopping the veggies. Wohoo! Skip peeling the potatoes and carrots. Just make sure to give them a good wash.
Just roughly cut the veggies and potatoes. We’ll use the immersion blender to puree the soup later on anyway. This is not some bland version of a traditional potato soup, but a full blown delicious recreation built from scratch - all vegan of course! Chop up the ginger and garlic, fry on low heat in a large pot. In the meantime wash then cut the potatoes and ‘soup green’ (the other veg) into rough pieces. 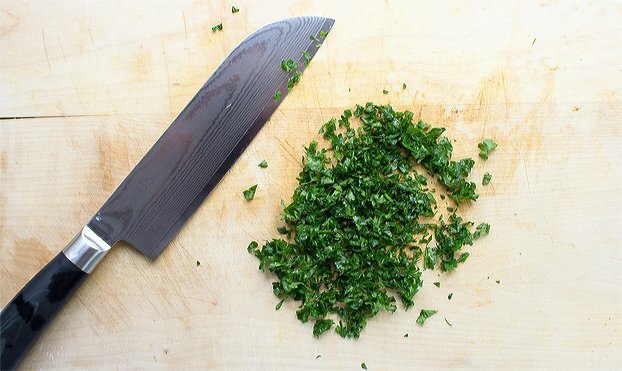 Chop the parsley finely, and the chili if you’re using one. Then add the potatoes, other veg and parsley to the pot. Add bay leaves as well, if you have. Keep some parsley for garnish! Top it up with the vegetable broth, bring the mix to a boil and then let it simmer for 20 minutes. When the potatoes are soft take out the bay leaves. Add the coconut milk and lemon. Now finish off the soup with salt, pepper, and nutmeg. 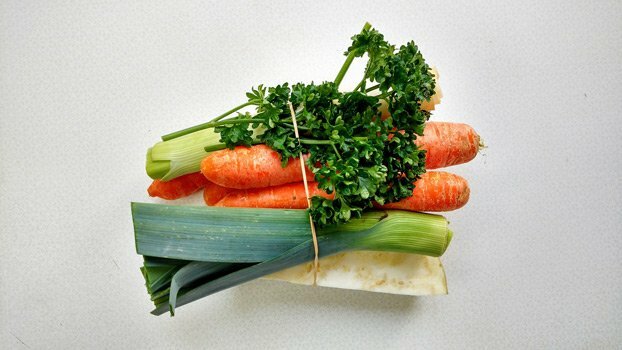 What is nobly celery? I’m in Canada and don’t have the vegetable “green” mix. How much in cups do you need for the soup? This looks absolutely delicious Howie! I love adding coconut milk to all my soups, it makes them so creamy. Having a brother as a chef must come in handy! 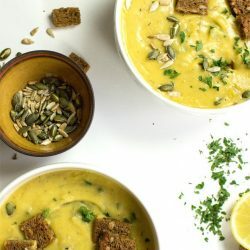 Creamy, vegan potato soup is such a comfort food and I use coconut milk too but I haven’t made it before using as many ingredients. I bet the taste is just fabulous! Made this for dinner tonight. I subbed fennel bulb for the celeriac since I didn’t find that at the store. Not too much fennel, just enough. The soup was heavenly! The flavor melding of ingredients is delish. I’m wondering if leftovers can go in the freezer? I’ve used coconut milk before, but have never had enough of a dish left to be able to freeze it. I love this concept of “soup green”. I wish it was readily available here. I love the color of your soup. When I make potato soup, it is never this bright! And did I say, I love how creamy that looks?! Thanks Manju! Yes, the coconut milk is a winner for sure! My favorite soup! But I never added parsley to the soup. Wonder how they tastes in soup! Hmm I will try next time 🙂 Thanks! I agree, I use either coconut milk or homemade thick cashew cream for all of my potato soups! So delicious! I love your recipe, the flavors sound wonderful and I love that beautiful color! Glad you liked this soup!! As someone pretty new to cooking the prep took me quite a bit longer – still slow with a knife. Like another commenter, I used fennel instead of celery root and also sauteed some yellow onion. I made it with red potatoes instead of floury potatoes (all I had on hand). I ended up having to scoop out the potatoes and bake them in the microwave since a lot of them wouldn’t get soft. (It was a ton of potatoes so I’d bake – scoop top into pot – bake and so on). Still turned out okay – it kept a lot of texture from the potatoes, which wasn’t bad, but it depends on your taste. And then I added some tikka masala sauce straight from a jar and it was awesome. If a vegan wanted to try that they might have to make their own (mine had cream). 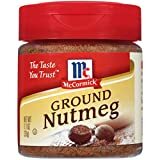 Next time I want to try with the nutmeg and lemon, and maybe I’ll add a little cinnamon, maybe corn after pureeing and simmer the masala sauce. Either way good on you for diving more into cooking Hopefully you’ll like trying out some more recipes! Great recipe..thank u! I used cilantro instead parsley..loved it! This was a huge hit for my ENTIRE family, kids too. (Which never happens.) Followed basic recipe to the letter. Will be putting this one in the “keep” pile. Thanks a bunch!! Indeed it is! Funny stuff actually. In Germany you find “soup green” in every single supermarket. Even the discounters; it never occurred to me that this was a German thing. The picture shows a bayleaf or two in the pot with the other vegetables. Was it omitted from the recipe by mistake? Muneeba! You’re absolutely right, this needs to go to the “optional” section of the recipe. Thanks for the heads up. My brother (author of the recipe) loves bay leaves and he swears by them. When I tested this recipe a couple of times I tried it with and without. I didn’t find there was a noticable difference. I also use a cashew cream for my potatoe soups and many other things. My children now young adults have always loved my potatoe soup. I am making some today and I am going to try your recipe with the coconut milk. My son is home from college so here goes to a rainy day and a new version of potatoe soup. Thanks for sharing. 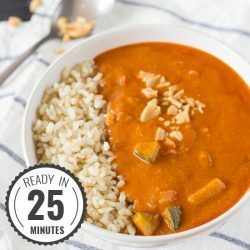 Do you have any vegan or vegetarian recipes high in protein? I raised my kids vegetarian, now my son of 6’8″ works out 2 hours a day and eats chicken and salmon to get more protein. He needs quick healthy recipes due to school and work schedule. He does meal prep on Sundays. I would rather he not eat animal products. 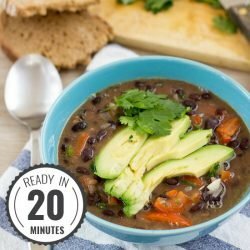 My husband and I really enjoyed this soup! I had never tried celery root before, found it easily at Kroger (our local grocery store) and really liked it! 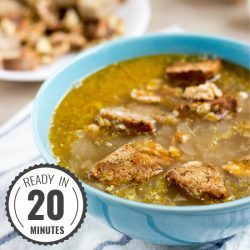 This soup made for the perfect rainy Sunday meal! Went specifically and Google for potato soup vegetarian and found yours. Looks yummy. Being in Hawaii we use lots of coconut milk, shavings etc. When you find in the forest a young sprouted coconut, it has a “foam” inside which is not hard, super sweet and delicious. Reserved only for kings and queens In the ancient times. Tried and tested. This is going to be one of my favourite d soups from now on. I didn’t have celery (which oils have added additional flavour) but I put 1,5 leeks and also used 1 whole lemon. I found that adding chilli flakes and parsley as garnish really draws out the flavour. Thank you!!! Nice additions Andra!! I love the leek idea actually, I bet that was great. You’re more than welcome, of course. See you around! wonderful! a suggestion: when it says “then everything goes off into the pot” that’s what I did – until I saw that the coconut milk holds til later, etc., etc. maybe just readjust the order of those instructions. thank you for the recipe! taking the time to share it – thanks very much. Howie: First snowy Saturday in the Chicago suburb of Glen Ellyn and I decided to make your recipe. 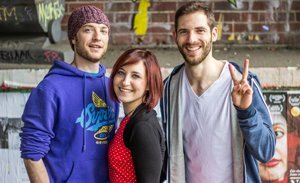 All I can say is: Schmecht ganz gut!!!! I’m bookmarking this recipe. Thanks so much! Wow, it started snowing in Chicago? Oh dear! But this soup is deffo the right answer, glad you liked it! Oh my! 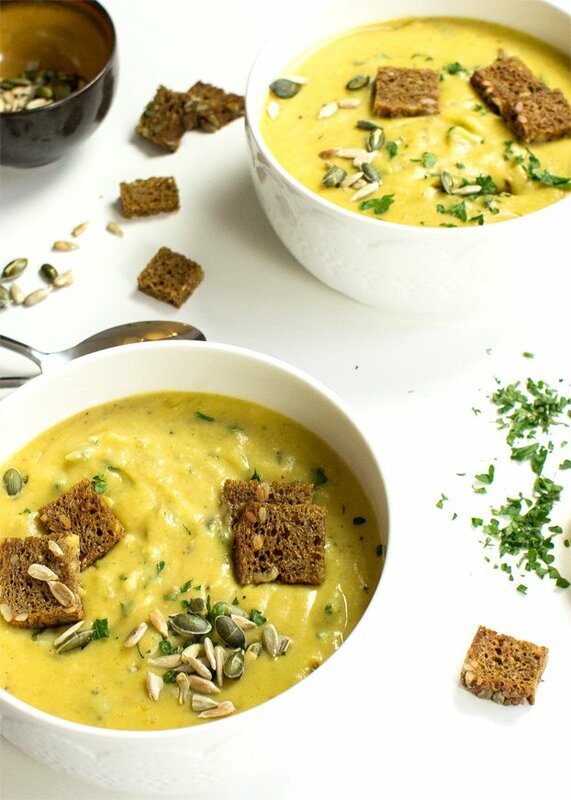 This vegan potato soup was delicious and so easy to make! Will have to try this for my family. Thanks so much!